EMS has a wealth of experience when it comes to providing smart printing solutions to the Education sector. We are familiar with types of issues schools and colleges encounter and have the expertise to implement a secure, efficient, cost-effective print environment through our hardware, software and excellent service. Connect to two networks, for example, a ‘learning [student]’ domain and an ‘Admin [staff]’ domain. “We have worked with EMS Copiers for several years. We have now streamlined, efficient an extremely cost-effective Managed Print Solution that meets all of our requirements”. Before we implement a Managed Print Solution we take the time to familiarize ourselves with the school or college, its layout and carry out a detailed audit of the volumes produced on the existing devices. Factors such as expansion or downsizing are all taken into account. By taking the time to go through this process EMS can provide a detailed and accurate analysis of potential cost and efficiency savings. Essentially a new device/s with no capital outlay. Maintenance and toner included. All of our devices print, copy and scan. EMS offers a range of bespoke software solutions designed for specific functions or vertical markets to fit in with your process. Our software packs are essentially a mix of software, hardware and professional services that, when combined, produce a package of products bespoke to the clients’ needs with the flexibility to adapt and scale as required. EMS also offers an intuitive Intelligent Colour Billing Solution. 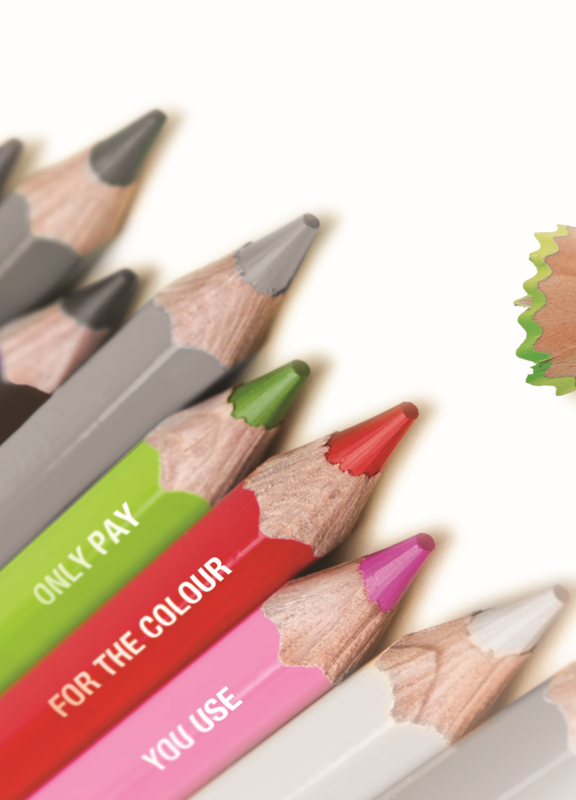 Put simply, we automatically calculate the amount of colour toner you use per page and reflect this in your billing. So you only get charged for the amount of colour you actually use. IT Printer Security is indispensable for secure business operations and uninterrupted processes. Whether it is because of the increasing threat of cyber attacks, the growing number of applications and sensitive data, or new regulatory requirements, security in office communication represents a challenge for every place of education. The result of a data breach can be devastating to a school or college, large or small. As well as huge penalties, imposed by strict new compliance regulations there is damage to a schools reputation. As firewalls are no longer enough to protect your data, it is essential to implement multiple layers of protection down to every network endpoint—from PCs to printer and address compliance requirements. The EMS Managed Print Solution provides robust energy efficient, high-speed, high-quality printing, copying, scanning devices. We offer a wide range of machines with no capital outlay. Top quality service from our experienced team, plus toner all included one payment. The EMS Managed Print Solution gives you complete visibility across your print environment allowing you to plan and budget accurately. The first step to reducing your print costs is to contact the EMS team.